Packing around your entire toolbox on your motorcycle isn't exactly practical or all that aesthetically pleasing for that matter. While most bikes come equipped with a tool kit from the manufacturer, they are pretty minuscule and often contain tools that seem as if they were made from recycled soda cans. Enter the pre-packed tool kit. Whereas once, riders had to spend their hard-earned money on a nice sturdy pack as well as outfitting said pack with all the appropriate tools, there are now a whole slew of manufacturers that offer decent packs filled with decent tools all for a decent price. The CruzTools Road Tech H3 kit aims to be the "last tool kit you'll ever need." 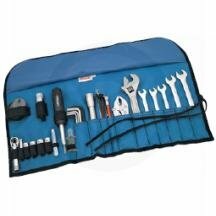 The kit comes with a good spectrum of SAE combination wrenches, an adjustable wrench, locking pliers, a bright LED flashlight, tire gauge, hex and Torx keys, screwdriver and a mini ratchet and socket set. The two biggest advantages of any kit like this are the price and the higher quality tools. If you were to buy all the tools individually, that alone would likely cost more than the whole kit. This pack doesn't have the extra storage for maps, snacks, or much of anything else but it isn't marketed as a trail pack. It is meant to be a replacement kit for the one that comes from the manufacturer and in function alone; it most likely far exceeds that. Here's a tool kit from Harley-Davidson in a more attractive tool case.